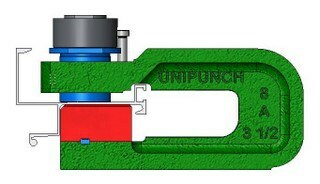 “AH” series punching units are in the UniPunch product line to offer tooling that can punch up to 1/2″ thick mild steel. Available “AH” series holder widths are: 2 ½”, 3”, 3 ½” and 6”. Holder width is important because it defines the minimum hole to hole distance. Depending on your material thickness, punch diameters are available from .2500” (6.35mm) to 3.000” (76.20mm). This series can punch up to a 3” diameter hole in 1/4″ mild steel and up to a 1.500” diameter hole in 1/2″ mild steel. (For a 4.000” hole in 3/16” mild steel, see the OA-6 unit. For thicker punching applications, see the “AD” series.) The “AH” series features multiple heavy duty springs in order to strip punches from mild steel as thick as 1/2”. 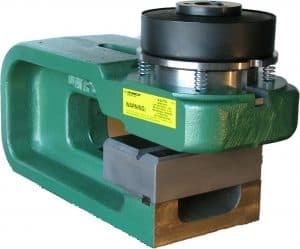 Hardened steel bushings are installed in the holders to provide long life and accurate rigid alignment of punches. In addition to a wide range of standard round and shaped punches and dies, UniPunch provides punch and die pairs in shapes custom made to your specifications. The “AH” series is available with holder throat depths of 8”, 12” and 18”, which means the center of the hole can be that distance from the edge of the sheet. For applications where holes are required near the legs of angles or extrusions, UniPunch can provide block style dies in AH and A Series units. The block die can also provide the required front to back part gauging.